There are numerous causes of salivary enlargement, which can be broadly divided into focal masses (which may be neoplastic or non-neoplastic), and diffuse salivary diseases, which may be secondary to obstruction of salivary ducts (obstructive sialadenitis) or a wide range of other infective, inflammatory, autoimmune, and other pathologies. The clinical history and examination are important to direct imaging. Pertinent features include prior head and neck disease, smoking history, patient age, speed of onset and growth rate, lesion location, size, and multiplicity, features of obstruction (gustatory swelling, stone passage), malignancy (location, firmness, fixation, facial palsy, enlarged lymph nodes), or infection (fever, rapid enlargement, erythema). Imaging fulfills several roles in the initial work-up, including localization, diagnosis or characterization, staging of malignancies, image-guided biopsy, and therapeutic interventions (aspiration and stone extraction). A handful of pathologies have characteristic diagnostic imaging appearances such as sialoceles, ranulas, lipomas, neurogenic tumours, and AVMs. However, many lesions, including salivary neoplasms cannot be diagnosed definitively by imaging and thus require fine needle or core needle biopsy for confirmation. The choice of imaging for salivary masses depends on many factors, including presumptive diagnosis, available resources, and expertise, although wherever available, ultrasound (US) is the preferred initial technique. US is safe, inexpensive and allows characterization and localization, as well as image-guided biopsy. By allowing preliminary characterisation different types of pathology, for example by separating masses into those with non-aggressive (Figure 1) and aggressive features (Figure 2), US serves as a gatekeeper for further imaging. Grayscale and power Doppler US of a mass in the superficial parotid lobe. It is smooth, hypoechoic, and has minimal intranodular vascularity. This is a non-aggressive appearance which includes benign neoplasms and low- to intermediate-grade malignancy. The FNAC and histological diagnosis was pleomorphic adenoma. 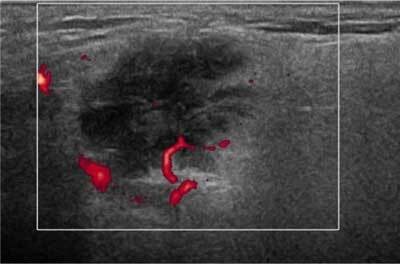 US with power Doppler of a mass in the superficial parotid lobe with irregular margin, suggestive of an aggressive lesion. The histology was metastasis from nasopharyngeal carcinoma. 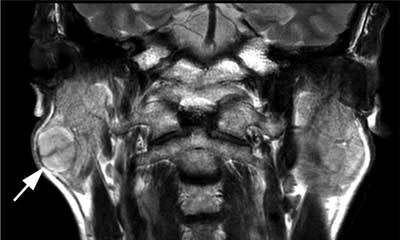 Magnetic resonance imaging (MRI) has excellent soft tissue resolution and is specifically indicated for deep lobe parotid tumours and known or suspected malignancies, where it is important for assessing deep tumour margins, regional lymph nodes, invasion of adjacent structures, and, importantly, perineural spread. Advanced imaging techniques including diffusion-weighted imaging and perfusion analysis with time intensity curves (TICS) have additional diagnostic value for differentiation of Warthin tumours, pleomorphic adenomas, and some salivary malignancies. Computed tomography (CT) has a relatively limited role, although is useful both in patients who cannot tolerate MRI acquisition times and for evaluating salivary abscesses and associated deep neck space collections, stone disease, image-guided biopsy of deep lobe parotid masses, and staging of regionally advanced malignancies. 18-F-Fluoro-deoxyglucose (FDG) positron emission tomography (PET), plain radiography and sialography have relatively selective roles. Of note, PET-CT is unhelpful for salivary tumour characterization, as benign and malignant salivary neoplasms show marked overlap in FDG uptake. Primary salivary neoplasms are uncommon and histologically diverse. Fortunately, most neoplasms are benign and the risk of malignancy depends on the gland involved, equating to 20%–25% for parotid glands, 40%–50% for submandibular glands, and 50%–81% for sublingual or minor glands. Most benign tumours comprise Warthin tumours (adenolymphomas) and pleomorphic adenomas (benign mixed tumours), which may display classical imaging appearances on US and MRI. However there is sufficient overlap with other neoplasms such that fine needle biopsy is almost invariably indicated. Primary salivary malignancies show a diverse range of imaging appearances, which reflects different tumour histologies and grades. A mass with irregular margins is highly specific for malignancy, notably high-grade types such as salivary ductal carcinoma. Other suspicious malignant features include infiltration of adjacent structures (specific but insensitive), low T2 signal, poor post-contrast enhancement. Nevertheless, over 50% of salivary malignancies have non-aggressive appearances, including smooth margins, especially low and intermediate grade types such as low-grade mucoepidermoid carcinoma and acinic carcinoma (Figure 3). Consequently, the reporting radiologist should not mislead the referrer by stating that a salivary neoplasm appears benign, rather it has a non-aggressive appearance that includes benign neoplasms and salivary malignancies. T2-weighted coronal US of a right superficial parotid mass with smooth margins and moderate T2 hyperintense signal. This mass appears non-aggressive. The final histological diagnosis was acinic cell carcinoma. For parotid tumours, a superficial or deep lobe position should be documented to assist the surgeon in pre-operative planning and patient counseling regarding the risk of facial nerve injury. Finally, it is worth highlighting that sensitivity and specificity of fine needle cytology and to a lesser extent core needle biopsy for malignancy is imperfect, reflecting sampling issues and histological features that can confound specimen interpretation (e.g. squamous metaplasia in Warthin tumours). Multidisciplinary team involvement is useful in the work-up of malignancies and cases with discordant findings. Review of imaging may alter management, for example radiologists may specifically target regions in tumours that are more suspicious of malignancy. This talk will outline the imaging appearances of major salivary masses with a focus on salivary neoplasms. Specific examples will be used to highlight potential pitfalls and learning points.